Hamama counts on her fingers, tapping them in succession as she lists one-by-one the cleaning products she has stocked in her mini-market. It’s a seemingly long inventory, but according to Hamama, it is not long enough. She has another list of products, items she must add, to satisfy all of her customers’ preferences. “My philosophy is that a customer needs to be welcomed and receive the best service. If I don’t have what they need or came for, I tell them, ‘it’s no problem, I will get what you need’,” she explained. 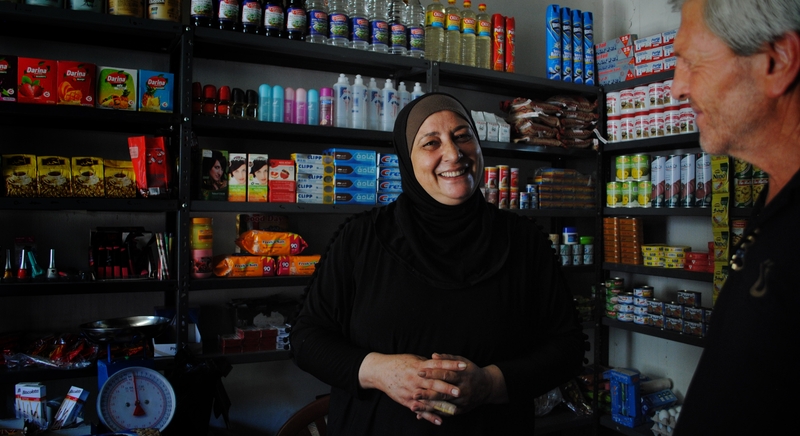 After her husband unexpectedly lost his full-time job, Hamama’s mini market, nestled in a busy residential street in Al Marj, Bekaa, became the family’s only source of income. Overnight, she became responsible for generating enough profit to cover day-to-day living costs and maintain substantial monthly loan repayments. Faced with crippling financial pressure, Hamama focused on building her business and sought out NEF support. Nowadays, Hamama and her husband work together to manage the constant flow of customers and suppliers and constantly strategize about how they can develop the mini-market into a supermarket. With the bank loan and significant monthly medical costs, they are realistic about the supermarket dream. Hamama has a small tin where she puts savings aside each week. As a first step, she has turned her focus to her younger customers and is saving for a freezer, hoping to satisfy and capitalize on their summertime ice-cream demands.